Horse-drawn carriage rides have long been a controversial topic on the downtown streets of Victoria. From angry honking drivers, to protestors walking with signs, to those just being concerned with the horses’ overall safety, most people have an opinion. 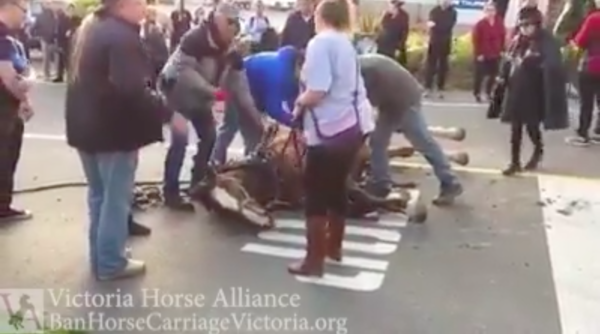 Following an incident on May 4 where a horse was spooked and fell following a minor collision with a tour bus, the British Columbia SPCA called for the banning of horse-drawn carriages within Victoria. While they have previously suggested stricter guidelines than those that currently exist, this is the first time the non-profit has called for an all-out ban on the popular tourist attraction. With Victoria Carriage Tours, these rides can range anywhere from $19 to over $200. Most tours trot around James Bay or Government Street, highlighting the historic aspects of the city in a traditional way. While the Times Colonist has posted an editorial and several opinion letters from locals claiming “the horses are just fine,” I could not find an article arguing for the banning of the carriages on their site, despite their replies on Twitter being packed with opposition to the carriage rides and their Facebook page being torn apart by the opposing sides in the comment section. The necessity of horse-drawn carriages have long been a heated debate in Victoria, but with opinion still split, the only thing we can do now is sit like the horses and wait to find out their fate.